Puerto Vallarta, Jalisco. México C.P. 48390. Garza Blanca Resort & Spa Puerto Vallarta is excited to announce its most recent award for Mexico & Central America’s Leading Hotel Suite 2017 presented by the World Travel Awards. Puerto Vallarta, October 2nd, 2017. The Grand Penthouse at Garza Blanca Resort & Spa in Puerto Vallarta received the top accolade for leading hotel suite in Mexico and Central America. The impressive three-bedroom duplex residence came top amongst competitors that included the Four Seasons and the Hilton. 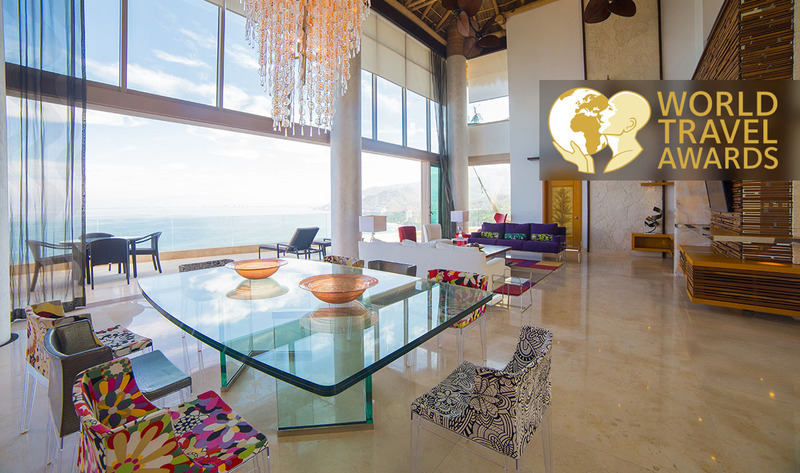 The Grand Penthouse crowns the mountainside with spectacular panoramic views of Banderas Bay. This magnificent duplex spans 5,000 square feet with stunning features like an ultra-high ceiling in the grand living room topped with a beautiful palapa roof and state-of-the-art gourmet kitchen. Chic contemporary design that combines with traditional comforts make the three-bedroom Grand Penthouse stand out among its class. Located atop the hillside panorama properties, here you will experience a sense of a true bird’s eye view of the whole bay. This property is truly something special. Eva Longoria, Vanessa Williams and Lea Michele, amongst other celebrities, have all stayed at the Grand Penthouse enjoying the luxury Puerto Vallarta resort for their vacations. 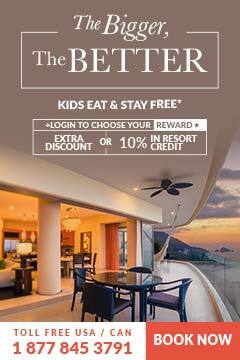 Located only 10 minutes from downtown Puerto Vallarta, Garza Blanca Preserve Resort & Spa can be found nestled at Km. 7.5 on highway 200 to Barra De Navidad from Puerto Vallarta, Mexico. It is a luxury resort and spa developed in conscious harmony with 85 acres of beachfront tropical jungle offering a range of elegant suites and luxury residences including penthouses. Ideal for families, couples, honeymooners, wedding parties and groups of friends looking for chic, sophisticated relaxation by the beach. Offering ultra-chic contemporary vacations for guests aged 16 and over, Hotel Mousai is a cutting-edge luxury beach resort sitting like the crown jewel at the heart of Garza Blanca Preserve. Featuring gourmet restaurants, infinity pools, and a collection of lavish junior suites and penthouse in addition to the most dazzling and pampering spa in the area. TAFER is a forward thinking leisure and hospitality company with an ever-growing and evolving collection of award-winning hotels, resorts and boutique villas, including the distinctive Garza Blanca Preserve Resort & Spa and Hotel Mousai in Puerto Vallarta, Villa del Palmar Cancun Resort & Spa, Sierra Lago Resort & Spa and Sian Ka’an Village, with Garza Blanca and Hotel Mousai resorts soon to be launched in both the Riviera Maya and Los Cabos. Being too a principal owner of The Villa Group Resorts, which boasts nearly 30 years of success, TAFER’s mission is to continue to merge excellence, quality and creativity. Constantly seeking to reflect the artistry that lies at the heart of the leisure industry, the company encompasses all aspects of hospitality: hotel design and construction, resort management, timeshare and residence clubs, marketing and concept design as well as tour and travel agent services.